Dash Adoption Grows in Venezuela -- Will the Bulls Power Toward $100? Dash Adoption Grows in Venezuela — Will the Bulls Power Toward $100? KFC is set to start accepting DASH payments at its first branch in Venezuela by next week. The legal cannabis company Alt Thirty Six, which uses DASH, has partnered with tax compliance software company NODE40 to keep on top of governmental obligations. Support moving forward: $69.49, $67.28, $65.07, $61.91, $60.86, $59, $50, $44.51, $37.71, $27.35. Resistance moving forward: $76, $81.97, $84.18, $88.52, $90, $100, $103.13, $117.19, $130.28, $150. Dash has continued to gain major adoption in Venezuela as the country continues to struggle with the stability of its economy and currency. In a recent tweet by Mark Manson, director at DashPay News, he announced that DASH will be accepted at the KFC Caracas branch in Venezuela from next week, followed by 24 more branches throughout the country. Although the source is reliable, this has yet to be confirmed by the KFC branch in Venezuela themselves. There are now over 2,400 merchants in Venezuela that accept DASH as a payment for their commerce. It began with small stores and food trucks. Now, some commercial entities such as Subway and Papa Johns have started to accept DASH at some locations. In more Dash news, the cryptocurrency tax compliance company, NODE40, has recently partnered with Alt Thirty Six, a company that provides point-of-sale systems geared towards making the legal cannabis industry a cashless market. Alt Thirty Six uses DASH as a cash alternative. The partnership will help Alt Thirty Six remain compliant with tax laws throughout the U.S. as NODE40’s Balance platform will monitor transaction data to help stay up-to-date with the relevant payments necessary to the government. NODE40 has been described as a software-as-a-service (SaaS) company as its sophisticated platform seamlessly allows its users to keep track of their tax requirements, allowing them to run their business more efficiently. Another recent development is that AVA trade, the CFD trading brokerage, has expanded its cryptocurrency options and now allows for Dash and Stellar to be traded on a CFD contract basis. Although you don’t own the underlying asset, this does help spread awareness of the cryptocurrency and allows users of AVA Trade to trade and profit from Dash price movements. 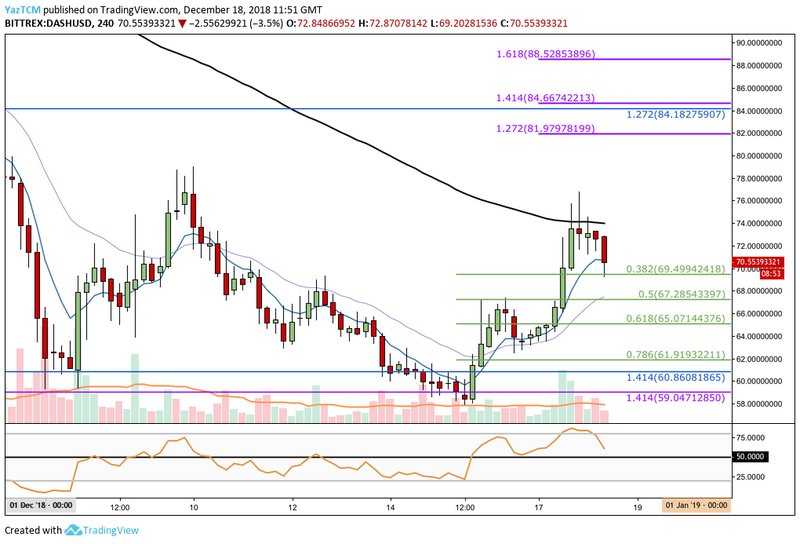 Let us continue to take a look at the market action for DASH/USD and provide any key support and resistance areas moving forward. Dash has undergone a 4.73% price hike over the last 24-hour trading period, bringing the current trading price to around $70, at the time of writing. The cryptocurrency has now seen a small 2.48% price increase over the past 7 trading days but is still suffering terrible losses which amount to over 49% over the previous 30-day trading period. Dash is now ranked 15th position and currently retains a market cap value of around $548 million. The 58-month old project now is trading at a value that is a significant 95% lower than its all-time high price. Since our last DASH/USD analysis last week, we can see that the market has rebounded from our outlined support level at the long-term downside 1.414 Fibonacci Extension level (drawn in purple) priced at $59.07. As DASH/USD approached this area, it created a double bottom within the market and proceeded to rebound over the following few days. The market has pulled back slightly after rebounding and is now trading around the $70 handle. The overall long term trend is bearish. However, the recent rebound may give hope as price action has ceased to make lower lows, and is now pretty much trading sideways. If we would like to see the market turn into a bullish trading condition, we would need to see DASH/USD break above the December 2018 high, around the $100 handle. Where is the Support For DASH Beneath $70? After reaching a high around $76, the market has reversed and retraced. If the bears continue to pressure the market below the short-term support at the .382 Fibonacci Retracement level (drawn in green) priced at $69.49, we can expect further support beneath to be initially located at the .5 and .618 Fibonacci Retracement levels (drawn in green), priced at $67.28 and $65.07 respectively. Further support below this can be expected at the .786 Fibonacci Retracement level (drawn in green) priced at $61.91, closely followed by the previous long-term support at the downside 1.414 Fibonacci Extension level (drawn in purple) priced at $59.04. What If DASH Breaks Above the $76 Handle? If the buyers within the market can continue on their bullish streak and push price action for DASH/USD higher, we can expect immediate resistance above to be located at the short-term 1.272 Fibonacci Extension level (drawn in purple) priced at $81.97. This is closely followed by the previous medium-term downside 1.272 Fibonacci Extension level (drawn in blue) priced at $84.18. If the bulls can continue to climb above the $85 handle, we can expect more short-term resistance at the 1.618 Fibonacci Extension level (drawn in purple) priced at $88.52. The RSI is currently heading toward the downside on the 4-hour chart. However, it is still above the 50 handle which indicates the momentum will still be in the buyers’ favor so long as the 50 level holds. The adoption rate of Dash in Venezeula is nothing less than remarkable, and the latest addition of KFC accepting payments takes it to a new level. 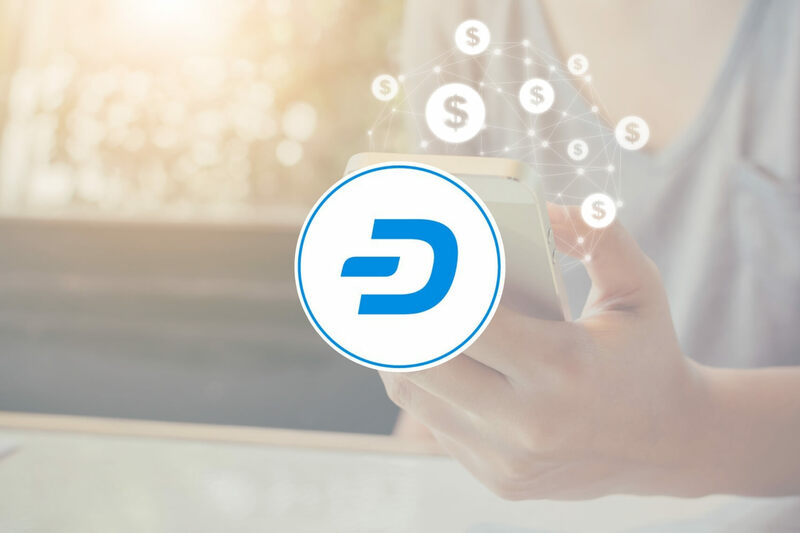 Although it is only one branch at the moment, more are expected to come and a snowball effect should follow with such a high brand adopting the Dash cryptocurrency.